SAN ANTONIO, TX--(Marketwired - September 22, 2016) - As students across the United States revel in the excitement of the "back-to-school" season, anxious parents and school nurses are faced with the annual spike in cases of head lice that coincide with the return to class. Head lice are tiny, wingless insects that live on the human scalp and spread between people by head-to-head contact or the sharing of hats, combs, brushes, or towels. August and September are traditionally months with the highest lice infestation rates. According to HeadLice.org, September is now "Head Lice Prevention Month." Adding to the concern is a newer variety of lice, often referred to as "super lice," which have developed a resistance to traditional pesticide-based lice treatment options. The good news is that these "super lice" can be eliminated utilizing the Lycelle® Head Lice Removal Kit. "Lice outbreaks at school are going to happen and parents should have access to a pesticide-free lice treatment that will work," notes Phill Dritsas, SVP, General Manager Consumer and Specialty Markets Division. 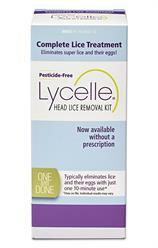 "Lycelle contains no harmful chemicals and is effective at eliminating all lice and nits -- including the new super lice. It is now available over-the-counter without a prescription. Pharmacists, school nurses, and pediatricians can feel confident in recommending Lycelle to treat children." Unfortunately, school attendance is sometimes affected when students are faced with lice infestations. Traditionally, parents were advised to keep their child home until their lice and nits were eliminated. This often required more than one application resulting in children missing school for several days until the lice problem was resolved. In most instances, Lycelle's single application eliminates lice, super lice, and their eggs, so children can return to school the next day. Lycelle is available without a prescription at Walgreens and select independent pharmacies. There are patient savings coupons for the product that can be downloaded from the website at lycelle.com. For more information about Lycelle or to order the product, please visit the website, or call 1.800.531.3333. Mission Pharmacal Company is a privately held pharmaceutical company based in San Antonio, Texas. For seven decades, the company has been improving the lives of people through every stage of life by identifying unmet healthcare needs and delivering innovative, high-quality prescription, over-the-counter, and dietary supplement products to meet these needs using only the purest ingredients and FDA-approved methods of manufacturing. Mission is recognized as a pioneer and leader in the therapeutic areas of women's health and urology and also offers leading products through its pediatric, dermatology, primary care, and long-term care service lines. Using an innovative business model, Mission has created wholly-owned subsidiaries, BioComp Pharma, Inc., a generic drug marketer; Alamo Pharma Services, Inc., a specialized contract sales organization; ProSolus, Inc., a transdermal drug developer and manufacturer; and BexR Logistics LLC, a logistics and fulfillment arm, to diversify its offerings and build forward-thinking partnerships with other pharmaceutical and biotech companies. Mission Pharmacal is a proud national supporter of the March of Dimes Foundation®, whose mission is to improve the health of babies by preventing birth defects, premature birth, and infant mortality. To learn more, please visit missionpharmacal.com. (1) Life Science Strategy Group, LLC. Web Patient Experience Survey of Lycelle. Respondents were compensated; September 2013; n≥50. Lycelle® Head Lice Removal Kit offers an over-the-counter, pesticide-free, and drug-free option for eliminating lice, super lice and nits.